Sometimes, especially in these days, getting a record or a rare version of it is just a matter of being fast. Other times, it's a matter of knowing the right people. But sometimes it's just pure luck. After this claustrophobic experience, when I recognized Toru's voice asking for me at the employees, it was a relief! On the way to his house, we got a wonderful dinner at a japanese barbecue restaurant. Then we stopped to an Onsen, a typical japanese public baths with hot spring water which was quite an experience! After a solid sleep, the next morning I woke up ready to achieve my main goal. I could lie, but the main reason for that trip was record shopping. After hearing for years a lot of stories about how amazing japanese record shops are, it was finally my time to check if the rumors were right or exaggerated. I headed straight to Shibuya's Disk Union since I also wanted to see the famous crossing. Now, if you're ever going to find a certain place in japan, be sure to get a map before or accurate directions otherwise you'll never find it. In case you didn't know, those wise bastards do not name their streets and buildings numbering is totally random. Smart choice. Since I'm an organized nerd, I got everything planned before leaving shitaly and found the place quite easily. 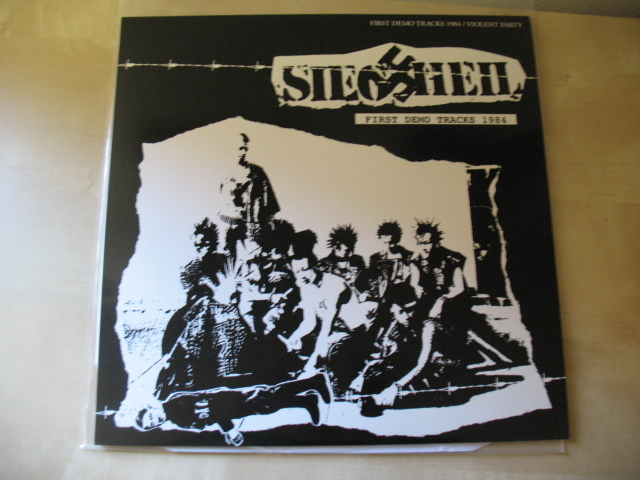 Sieg Heil "1984 demo" repressed on lp that Overthrow Records put out sometimes around 2006. Being on Overthrow, I missed it when it came out since it sold out pretty quickly. Damn collectors. 750 copies were made and they sold out immediately. Considering the price it sells for on eBay, I got this for a steal (20 euro-bucks). Basically this contains their first demo tape "Nazism", released in 50 copies by Violent Party Records back in 1984. In case you don't know, Sieg Heil were from the same city of Gai/ Swankys and Confuse and their sound is the typical Kyushu sound that we all love. I've heard funny stories about dumb crusties complaining about this band. So before pretending to be offended by something you don't even know, keep in mind that they weren't nazis. SH were just a bunch of high school kids looking for an easy way to piss people off. No big deal, sorry. Awesome band, I think they're even better than Confuse if you want my opinion. Later that afternoon, back to Toru's home, after a day of compulsive record shopping, I started to check all the records I bought that day. 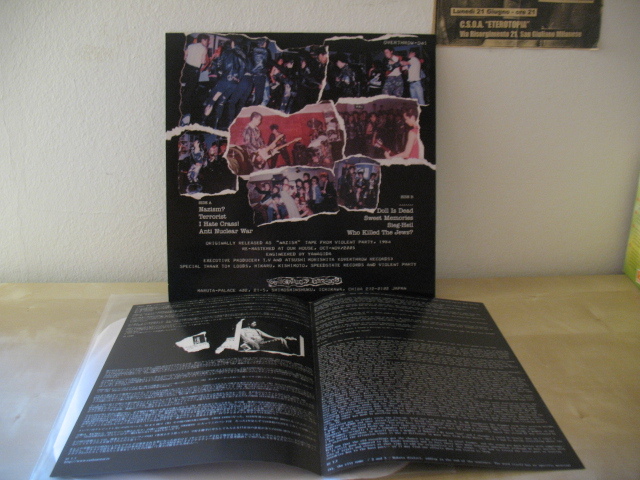 Sieg Heil lp came with a fold out insert with band's story written directly by band members both in japanese and english. I've got red wax! 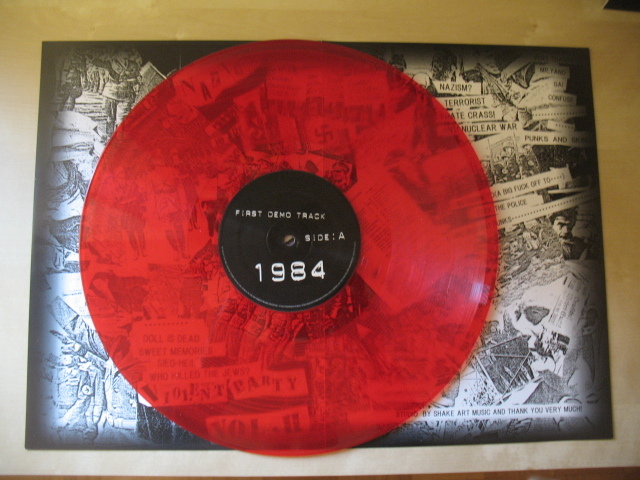 Most of the press is on black wax. I couldn't find any infos about it so I guess that something like 50 or 100 copies were made on colored wax as a limited edition. I've only seen one picture of another copy of this on red so I'd assume that it's pretty rare. If you have any infos about the pressing run, it will be extremely appreciated. So yeah, sometimes record collecting it's all about being damn lucky. And it makes you feel way better than just being fast on refreshing your browser.